In French with English subtitles. Widescreen. Emmanelle Riva won a Best Actress Award at the Venice Film Festival for her portrayal of a tortured wife in this 1963 French-language adaptation of the novel by Francois Mauriac. Director Georges Franju remains faithful to the book. Riva plays the title character, who feels suffocated in her marriage to the upper-class twit Bernard Desqueyroux (Philippe Noiret). Theirs is a bland marriage in an isolated country mansion surrounded by servants. Therese tries to poison her husband with arsenic, but the dose isn't fatal. She is arrested, but Bernard refuses to press charges, instead bringing her home to a prison of his own devising. 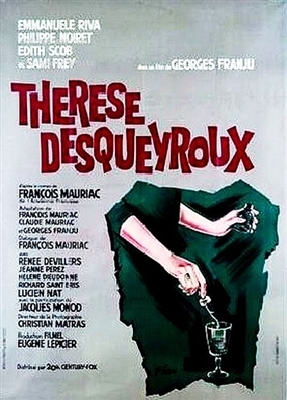 Thank you for my movie ThÃ©rÃ¨se Desqueyroux 1962 with subtiltes..I'm enjoying it now..